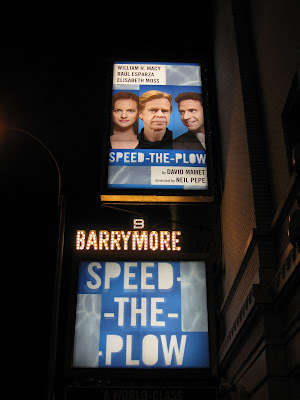 My decision to see Speed the Plow last night was purely one of peer pressure - or at least I like to think of them as peers. The ultra cool Suttonhoo was swinging through the city and suggested it. It worked out as a birthday celebration for dear Kari too. How could I resist? And guess what? I liked it! I really liked it! It's so funny! It was the first night for William H. Macy, after taking over for Norbert Leo Butz, who tookover for Jeremy Piven. Whew. Bill Macy is just too cute. And of course, Raul Esparza is to die for. Just give him a Tony already! He definitely deserves it for this performance. The regal Phylicia Rashad was there and so were Claire Danes and Hugh Dancy, both looking more waifly than ever. 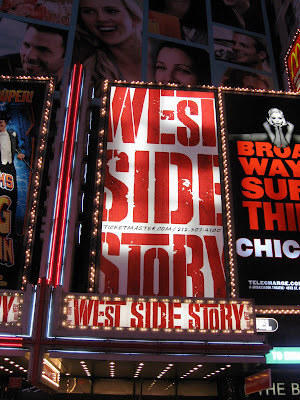 Before the show, I bought tickets for the first preview of West Side Story on February 21st (doing my part to save Broadway!). 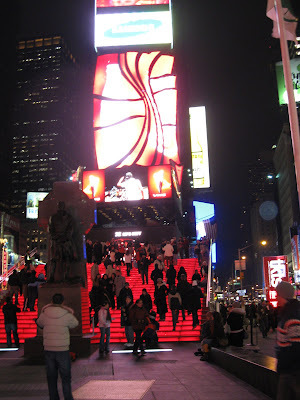 Then, I spent a little time in Duffy Square. There are always kids around Broadway handing out flyers for shows, but these sassy girls with the bowler hats and red tights for Chicago are my favorite yet. Sarah, Someone told me that William H. Macy was too old for his role - that Raul Esparza was supposed to be in the more mature role between the two men. What's your take? SOB, I didn't even think about it. I thought they were both terrific. I went in not knowing anything about the play - I sat through it, enjoyed the performances thoroughly and haven't thought another thought about it since. it blows up so big it's like I'm there! so good to see you! 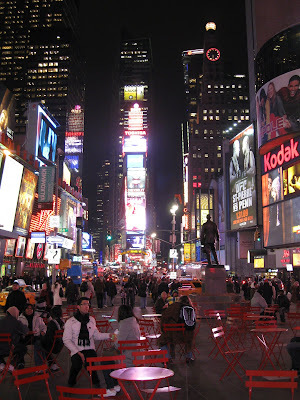 keep broadway alive for me until I get back.